Captain Fernao Pires de Andrade was a sixteenth-century Portuguese apothecary who somehow managed to have a grape name after him. Pires was sent to China to foster diplomatic relations between the Ming dynasty and the Portuguese crown, and I can't seem to ferret out why he ended up being the namesake of this grape. Apothecaries like Pires were often interested in plants, and they often used wine as a base for medicines--perhaps that's why. Perhaps it was a grape he brought back with him from his travels in the Mediterranean and Asia. Or maybe he was the first to identify it as an indigenous variety. However the grape got its name, it is an indigenous rarity that you don't see very often on US wine store shelves. 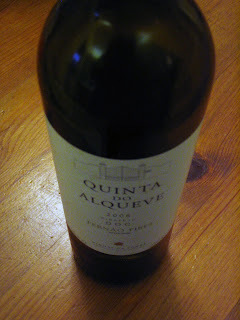 In hot pursuit of my Wine Century, I snapped this up when I saw it appear on the domaine547 website for just $9.99 in the form of the 2006 Quinta do Alqueve Fernao Pires. As with all grape varieties that you've never had before, one of the things that happens when you taste it is that you start grasping for similar taste experiences. Here, the best way I can describe it is that it's like a more aromatic verdelho on steroids. The wine was pale straw in color, and had abundant aromas of white flowers, lime blossom, lime zest, and chalk. The flavors remind you of these aromas, and as you sip it the wine picks up nice mineral inflections that talk the chalk into a more stony direction. Very good QPR for this price, and it would be a great substitute for verdelho or even a dry riesling if you are looking for a dry but aromatic wine. This wine would be perfect with fish, seafood, or moderately spicy cuisine. We had it with a traditional Spanish dish, Shrimp Pil-Pil. In Pil-Pil, shellfish are quickly sauteed with garlic, olive oil, salt, and lots of smoky-sweet paprika. After just a few minute, this all gets poured into a bowl and you serve it with a fresh salad and lots of crusty bread to mop up the sauce. Shrimp pil pil seemed made for this wine, with the lime and flowers providing a nice counterpoint to the paprika an garlic, and the stone and lime working nicely with the shrimp's brininess. Sounds like a fun and yummy grape varietal and definitely a value. I will do some looking at the shops around RIchmond and see if I can find one. whoops I guess we are in the 21st century. I realized that as I was reading what I posted. And NO, I haven't been drinking. I had a few wines with this grape at that large Portuguese wine tasting last November. Two that I specifically recall, and which I very much enjoyed, were the 2006 Casa Santos Lima (CSL) Fernao Pires & the 2005 CSL Palha-Canas. Thanks for the comments. John, Marco, this will certainly be a grape variety that I seek out in the future, because of its versatility as well as its food-friendliness. Richard, I haven't seen those in the shops--or indeed any Fernao Pires, with the exception of this bottle from d547--but they will go on my ever-expanding wish list of makers to look for in the stores. yeah, more Portuguese Grapes. You could do about 3 centuries worth if you just stayed in Portugal. Too bad they are so hard to find! BTW Your shrimp dish is traditionally not done with Paprika, but rather Guindillas, small super hot peppers, that are fried with the garlic....A staple for almost every terrace in Spain. They are also great with Cava! Ryan, the Portuguese and Spanish grapes are definitely what put me over 70 in the Wine Century Sweepstakes. Thanks for the news on Pil-Pil. Never had it before, so this is valuable information. I must say, however, that the Guindillas sound formidable from a heat standpoint. Perhaps it was a good thing that I started out with the wussy paprika.